In partnership with the Town of Normal, and in an effort to strengthen its off campus presence, Illinois State University has located its primary art exhibition space into the Town’s new multi-modal transportation facility. This newly constructed facility brings high speed rail, bus, auto and bicycle routes together at the center of Normal’s Uptown neighborhood. The galleries will further enliven this recreated neighborhood, which now houses a variety of retail, dining educational, cultural and recreational activities. The 8,300 square foot ground level space will provide ISU with a visible and easily accessible location for the community to engage in its flourishing fine art programs. The design provides several gallery settings the display of contemporary art from both emerging and established artists. A simple finish palette is used throughout to provide a sophisticated backdrop allowing the art to take center stage. Each gallery is equipped with specialized lighting, audio visual, and technology systems to accommodate a variety of media. 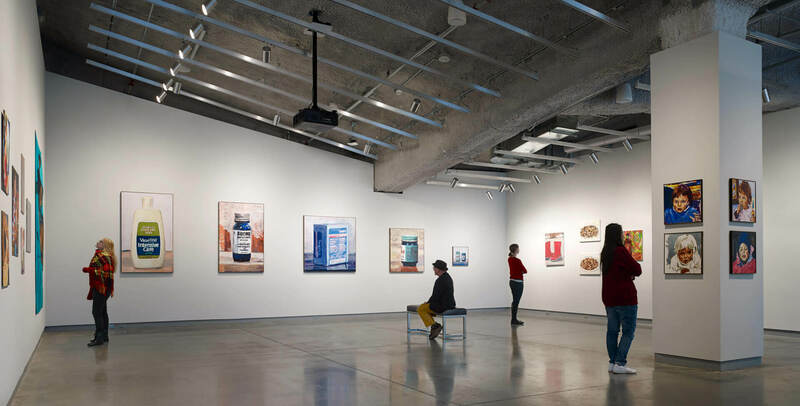 A centralized lobby allows each gallery to operate together or independently allowing for installation of new shows in one while the other galleries remain open to the public.